I was lucky enough to be invited to a birthday party of one of my 5-year-old cousins. 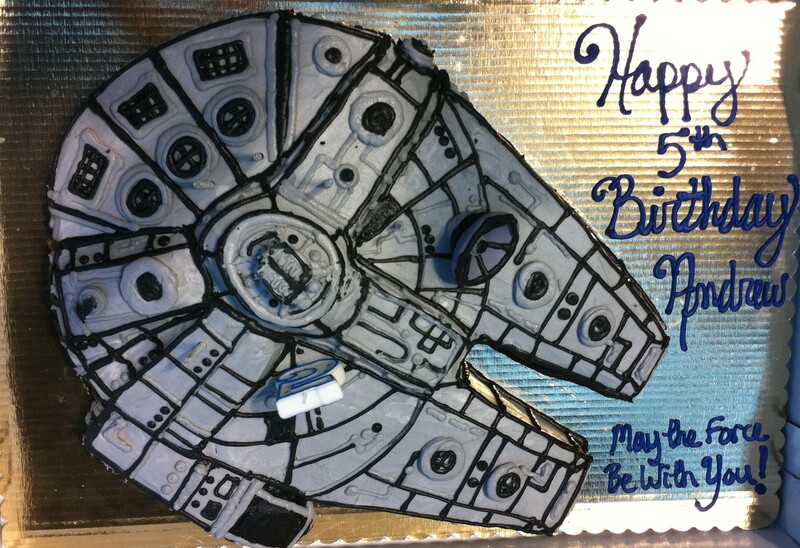 This was his cake, the Millennium Falcon, made at PJ Murphy’s. They specialize in assortment of fun cakes, cupcakes, cookies and other general bakery things. This was hands down the most elaborate, tasty cake I’ve ever seen. I want one for my next birthday! Now, PJ’s also did this cake for my daughter’s birthday last year. Now, it’s no Millennium Falcon, but it’s still pretty impressive. Sharon at PJ’s is great and loves creative suggestions, so long as there is a reasonable deadline. Just something to keep in mind when you are looking for a creative and tasty cake. That’s the place off of Randolph right? Wow what an amazing cake and I’m sure a very happy 5 year old. Yes, right on the corner of Randolph. Yes, two very happy birthday kids!